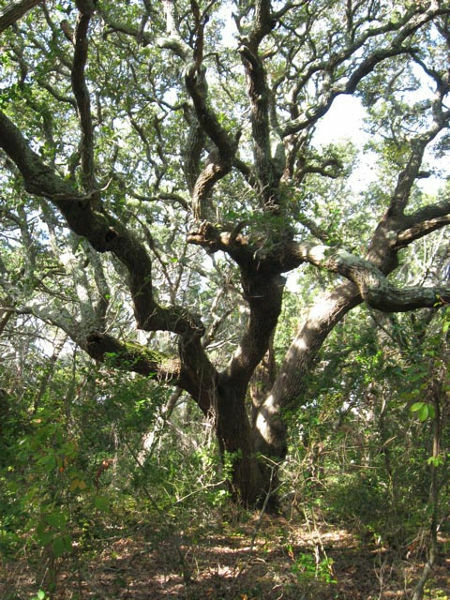 Ocracoke Island boasts a number of magnificent Southern Live Oaks (Quercus Virginiana), many of them hundreds of years old. 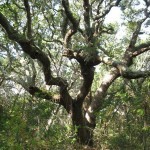 The live oak is the dominant hardwood tree found on Ocracoke. 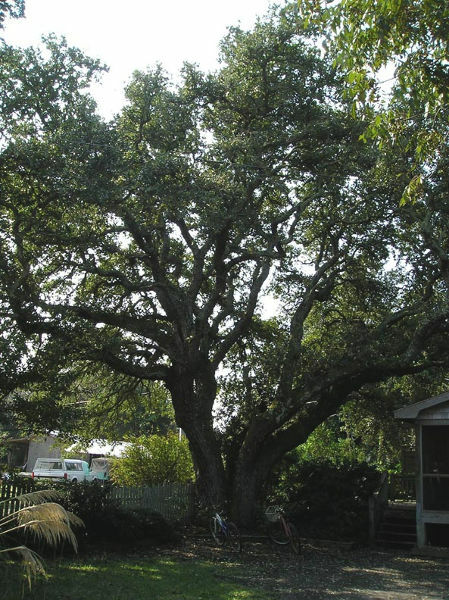 Southern Live Oaks grow from southeastern Virginia, south to the Florida Keys, and as far west as southern Texas. They can grow to a height of more than 75 feet, with a spread of up to 150 feet. Their lower branches often grow long, droop close to the ground and then curve back up in graceful arches. Live Oaks are so named because they remain green throughout the year, loosing their 2”– 5” oval leaves only in the spring as new dark green leaves sprout from their branches. 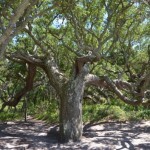 Live oaks are valued on Ocracoke for their beauty and shade. Their crowns are dense and provide ideal conditions for the nests of many bird species. They are salt tolerant and usually sturdy enough to withstand the assault of powerful storm-driven winds. 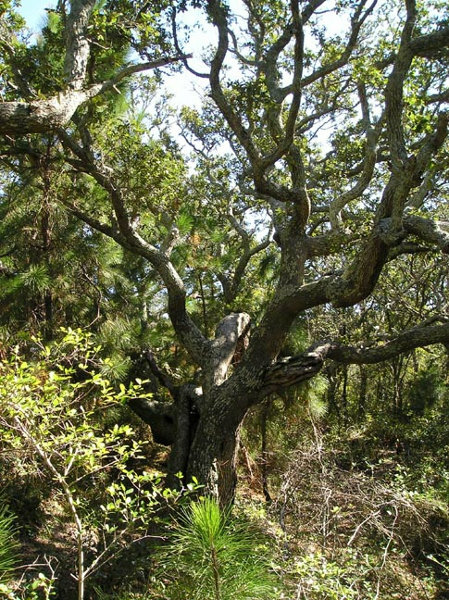 These hardy trees grow best in coastal areas in well drained sandy soil, so are frequently found on hills and hummocks both in Ocracoke Village, and elsewhere on National Seashore property. In the days of wooden sailing vessels, live oaks were prized for their density, hardness, and shape. Ship timbers, especially “knees” (framing members formed at right angles and used to secure beams to each other) and other curved structural members, were often constructed from the wood of live oak trees. 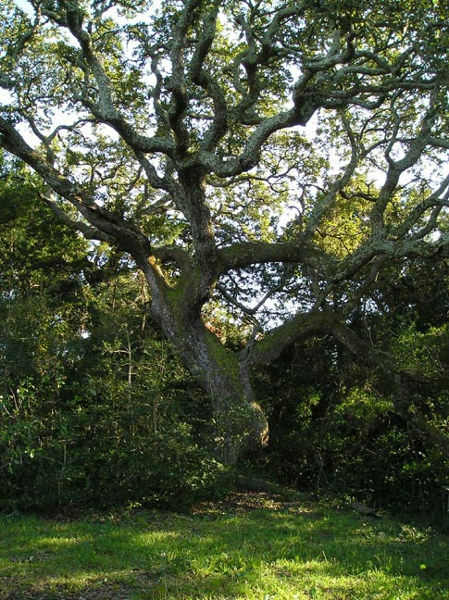 Islanders have passed down stories of early shipbuilders and their agents who walked from house to house examining the many live oaks that grew in the village. When they spotted a tree that was especially large, or that grew in such a way as to produce one or more natural knees, they would approach the homeowner and offer an enticing sum to purchase the tree. 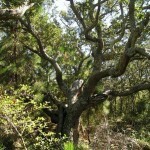 In this way a number of Ocracoke’s majestic old-growth live oaks were harvested in the 1700s and the early to mid 1800s. 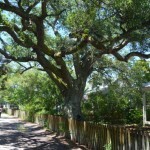 Today, efforts are made to save and protect the remaining live oaks that grace our streets, lanes, and yards. 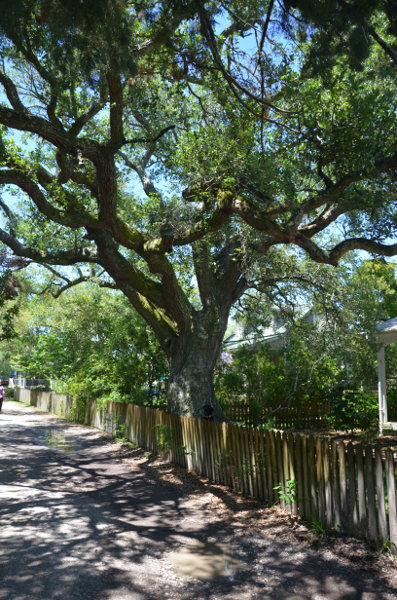 The two largest live oaks on Ocracoke Island are located on historic Howard Street. 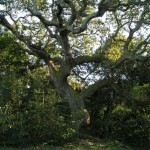 Six of Ocracoke’s live oaks are registered members of the Live Oak Society, founded in 1934 by Dr. Edwin Lewis Stephens. 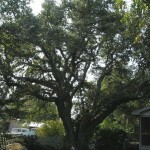 This organization promotes the culture, distribution, preservation and appreciation of the live oak tree. and one is on National Park Service property. 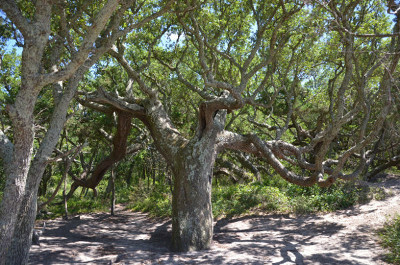 Three of these trees are on private property; two are located at Springer’s Point, a protected land trust; and one is located on National Park land. Please respect the privacy of land owners and remain on public thoroughfares. On public land please abide by all rules, remain on designated paths, and refrain from any activities that would damage the trees or surrounding vegetation or wildlife.